There is an estimated 6.7 million emergency hospitalizations every year in the US. 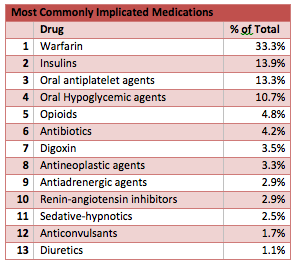 One out of every 67 of these hospitalizations is due to an adverse drug event. This is just one of the many interesting, although somewhat questionable points made by Daniel S. Budnitz and colleagues NEJM article titled “Emergency Hospitalizations for Adverse Drug Events in Older Americans”. It's a compelling article that, in part, attempts to persuade the reader that most emergency hospitalizations for adverse drug events in older adults are not the result of physicians prescribing inappropriate medications like those listed in the Beers criteria. Rather, the vast majority of hospitalizations are the result of a few commonly used medications, like warfarin, aspirin, plavix, and insulin. This would be an interesting finding, if it were true. Unfortunately, after reading this article I'm not sure it is. Over a quarter of a million (265,802) emergency department visits for adverse drug events occur annually among adults 65 years of age or older. The secondary outcomes is where I thought the most interesting and dubious points of the paper laid waiting for me. Only 6.6% of hospitalizations were attributed to Beers criteria potentially inappropriate medications. Does this mean the Beers criteria doesn’t matter, as long as you just don’t use digoxin? Absolutely not. The authors state in their discussion that inappropriate prescribing only accounts for a small proportion of all admissions due to adverse drug events. However, the study only classified adverse drug events if an emergency department physician both identified and documented the adverse drug event. What this study may actually tell us is that emergency physicians are really good at picking up not so subtle hemorrhages due to antithrombotic and antiplatelet agents, but they are more than likely not so good at picking up events like drug induced delirium. These types of adverse events from “inappropriate medications” are more likely to be diagnosed during the course of the hospitalization, or not at all. Like the medical practice clinic that tries to get all their elderly diabetic patients to a goal Hgb A1C less than 7, the authors fall into the trap of doing too much with a good thing. This study gives good evidence that serious adverse events are common, and that the older you are, the more likely they will occur. Trying though to downplay the significance of inappropriate medication usage in the elderly just isn't warranted given the limitations of their study. It is interesting to me that after a big push by the AGS (I believe under the influence of the pharmaceutical corporations) to have us believe that opioids are safer than NSAIDS, that while opioids are responsible for AT LEAST 5 % of ADRs ( likely not including delirium as previously noted) that NSAIDS don't appear to be in the top ten. "Benadryl is high risk? That's news to me. A doctor told me diphenhydramine is one of the safest drugs ever created, so safe it can even be used by pregnant women. Is there some new information that I haven't heard about? Oh, I see some people are greatly exceeding the recommended doses for the usual bad reasons. " NSAIDs are probably not in the top 10 because the complications associated with them are generally delayed and often diagnosed in the hospital setting, not in the ED. For instance, the work-up for acute renal failure generally takes a couple days to narrow down the culprit, and probably far to often chalked-up to dehydration in the elderly, and not underlying NSAID use. - the persistent application of young-adult goals for blood pressure and glucose control to elderly patients. - medication lists that are 15-30 medications long. - combinations of the above to produce iatrogenesis fulminans. This supports the idea that less obvious adverse medication events are likely under-recognized and therefore under-reported. That said, I suspect that the top four drugs on this list belong where they are. Hemorrhage and profound hypoglycemia (with associated falls) are likely to produce the least remediable problems. I would like to see a shift of thought that would require us to justify why we should use a med in a geriatric patient, as much as having to defend stopping one.